Aside from the initial thrill of visiting a new place, eating in a new city or country is the second-most exciting activity. Food is the easiest and tastiest way to be introduced to a new culture after a long flight, train/bus ride or cross-country road trip. San Sebastián was no different. It’s is a must-see beach city located in the northern region of Basque Country in Spain and Bardulia is a restaurant you don’t want to miss. This tortilla had so much flavor! Tortilla is a staple in the Spanish diet and you’ll find it everywhere from tapa and pincho bars to fancy restaurants. Bardulia’s tortilla was the usual egg and tortilla with fresh bread as the base, but the mix of onions and herbal seasonings set it a part from many tortillas I had eaten in Spain that only use salt to season. You can eat tortilla hot or cold, it’s all about personal preference. When eating pinchos 4 or 5 can fill you up, so my plate was pretty full. The crab on bread has a smooth consistency and doesn’t need much to be delicious. Same with the tortilla as I mentioned before, you can never go wrong with it. The mini- mushroom pie was a nice blend of mushrooms and onions. Though I’m pescatarian, it reminded me of what fancy restaurants put on top of steaks for added flavor. After this plate and the meals that followed throughout the weekend, I can say Basque Country has some of the best food I’ve eaten in Spain. 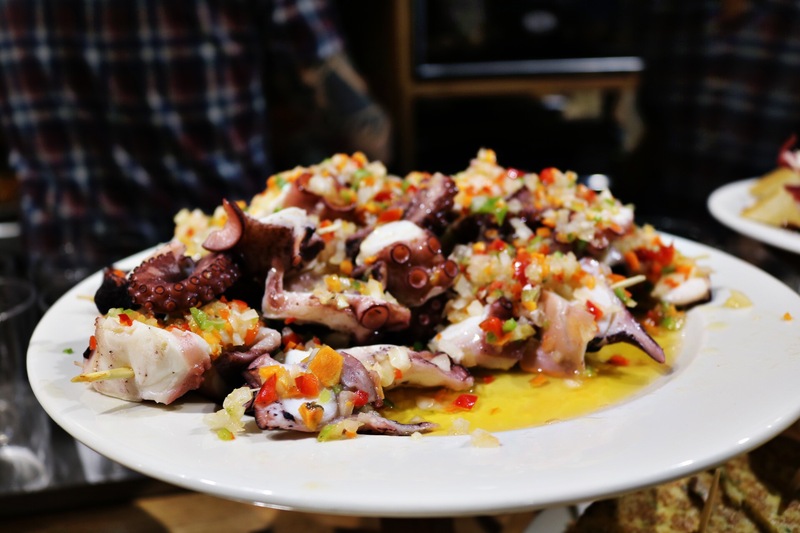 If you’re a seafood lover (or a person who doesn’t mind textured food), Spain’s octopus is for you. Hence the name, Galicia, not Basque Country, is known for their octopus throughout the country. Aesthetically, it’s the most interesting-looking yet beautiful dish you will see in the north and tastes delicious too. It’s a cold dish with the octopus as fresh as can be! It’s marinated in olive oil with peppers and onions. Spain has the best olive oil I’ve ever tasted so eating it on fresh octopus did not disappoint. Codfish is another popular dish on Spanish menus. Bacalao is the Spanish word for it and the dish itself is pretty simple depending on where you go. The codfish can be served without sauce, as Bardulia serves it, or with a tomato-based sauce like they do in La Rioja. I didn’t eat Bardulia’s codfish, but I appreciated the restaurant in its entirety. Basque Country is more expensive than some regions of Spain, but the food is worth every penny. From the atmosphere to the variety of pincho plates to choose from, I think everyone could find something they love there! Thanks for reading! Made you hungry? Pin it and save to drool over later!